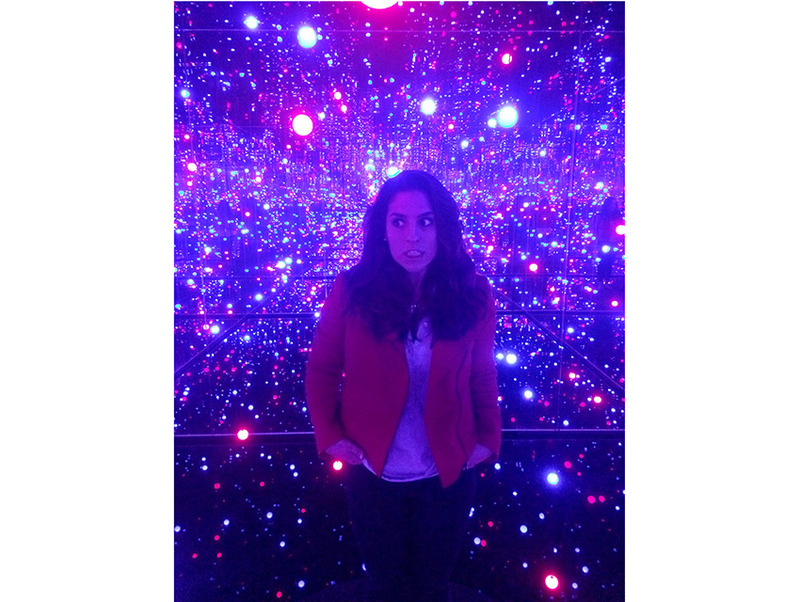 One of the 1,000 selfies I took at Kusama's Copenhagen installation. Earlier this year, my brother Nick and I paid a visit to Louisiana—not the state, but the modern art museum just outside of Copenhagen’s city center. As a fair-weather modern art fan (I couldn’t deal with Adriana Lara’s banana peel installation at the Astrup Fearnley Museet in Oslo), I am surprised to find myself writing that Louisiana might be the coolest museum I’ve ever been to. There wasn’t one exhibition I didn’t like, and—bonus!—there wasn’t one I was head-tiltingly confused by (although I’d have acted like I wasn’t confused, obviously). The highlight of the day, however, was a tiny room that Nick and I would’ve missed if it weren’t for a plate on the whitewashed wall that read “Gleaming Lights of the Souls.” To the left of the plate was a small ramp and a door. We pulled it open and stepped into a pitch-black a room with what looked like thousands of glowing LED bulbs. It sounds simple, but it was mesmerizing; the walls of the room were mirrored and the floor was made mostly of water, which gave a feeling of endless depth. (This is your PSA: visitors stand on a small platform in the water. Don’t step off unless you want to end up like Nick, who had to spend some time holding one shoe under a hand-dryer.) The whole experience was like taking a brief but magical walk in outer space, only more colorful. We spent a good 20 minutes marveling at light show, most of which was, admittedly, spent taking a lot of selfies. The exhibition is the work of Japanese artist Yayoi Kusama, and while the one at Louisiana is permanent, a version has been acquired by the Broad Museum and will be on view once the art house opens its doors September 20. 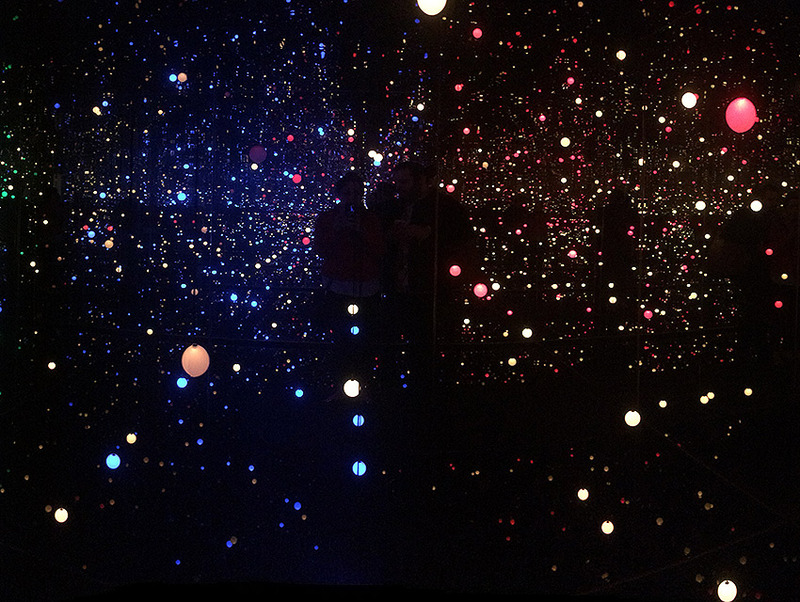 Yayoi Kusama got me like whoa. When the exhibition premiered at New York’s David Zwirner Gallery in 2013, crowds formed a line around the block (between this and LACMA’s “Rain Room,” your patience for standing in line to see cool art will be tried). In an effort to get as many people into “Infinity Mirrored Room” as possible, The Broad will be offering free timed tickets and will keep visitors’s ogling to a brief 45 seconds. As someone who has experienced the installation, take my word for it: this is no banana peel. Check it out when you can. "Gleaming Lights of the Souls."